We are a leading Manufacturer of Interlocking Paver Tile, Zebra Interlocking Paver Tile, Ishape Interlocking Paver Tile, Dumble Interlocking Tile, Modern Interlocking Tile and Zebra Interlocking Paver Tile from Gurgaon, India. With the support of our team of seasoned designers, we manufacture and supply an exclusive range of Interlocking Paver Tile. For manufacture this tile, our talented professionals use quality tested, raw material and contemporary technology as follows the industry laid norms. Our quality auditors carry out several inspection procedures on the offered tile using ultra-modern testing techniques. In addition to this, the provided tile is extremely valued by the clients for its attractive color and perfect finish. We offer an attractive range of Interlocking Pavers - 24 that is extensively used for external floors. These products are designed using high quality raw material that is quality tested before the production process. This quality material usage ensures their durability, high strength. These are available in various classic designs, attractive colors and other specifications as per the clients requirements. 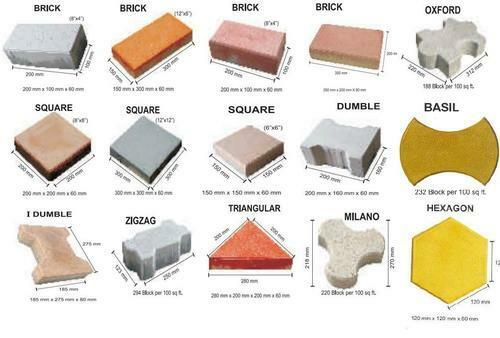 We are an acclaimed name engaged in offering our precious clients a superior quality range of Interlocking Paver Tile. The provided tile is widely used to design footpath and highly demanded by our patrons owing to its classy design and interlocking pattern. The offered tile is efficiently manufactured under the vigilance of dexterous professionals making use of the latest methodology. Our esteemed clients can avail this tile from us at a pocket friendly price in a given time frame. Being the prominent manufacturer and supplier, we are involved in providing Interlocking Paver Tile. Our provided tile is precisely manufactured under the direction of a skilled team of professionals making use of supreme quality raw material and pioneered techniques. In addition to this, the offered tile is widely acclaimed owing to its alluring design and high strength. This tile is made available in different design and pattern at a reasonable price. We are the renowned manufacturer and supplier of the best quality array of Interlocking Paver Tile. The offered tile is the perfect choice for permanent pavement of side roads. The provided tile is manufactured from superior quality raw material with the assistance of sophisticated techniques in sync with predefined industry norms of quality. This tile is accurately tested on parameters defined by our quality examiners in order to ensure its quality.